In the English-speaking world, Pikachu is “Pikachu.” In Hong Kong, things are more complex, especially after Nintendo renamed the franchise’s most famous Pocket Monster. Upcoming titles Pokémon Sun and Moon will be released in traditional and simplified Chinese in mainland China, Hong Kong, and Taiwan. Until now, different regions have used different translations to reflect the varied linguistic and cultural differences. However, this will change with Sun and Moon. Now Nintendo wants to unify them: Pokémon in Greater China will be officially called 精靈寶可夢, or Jingling Baokemeng in Mandarin (Jingling means “spirit” or “elf,” and Baokemeng is a transliteration of Pokémon). Earlier in Hong Kong, it was 寵物小精靈 Pet Little Elves (or Spirits), while in Taiwan, it was 神奇寶貝, Magic Babies. As Quartz notes, the renaming is having the biggest impact in Hong Kong, where Cantonese, not Mandarin, has traditionally been the common language. Pikachu was originally translated as 比卡超 (Bei-kaa-chyu) in Hong Kong. Now it is named 皮卡丘 (Pikaqiu). While the name 皮卡丘 in Mandarin sounds similar to the global name Pikachu (as it was always called in China and Taiwan), it reads as Pei-kaa-jau in Cantonese, which doesn’t sound the same at all. According to Quartz, the issue’s root is that in Hong Kong, many feel that Cantonese is being threatened by the mainland Chinese government. Fewer schools are teaching young children Cantonese, and there’s concern that it could disappear. This, along with a strong sentiment towards the traditional translation, is perhaps why Hong Kong Pokémon fans have been protesting the name changes on the Nintendo Hong Kong Facebook page. 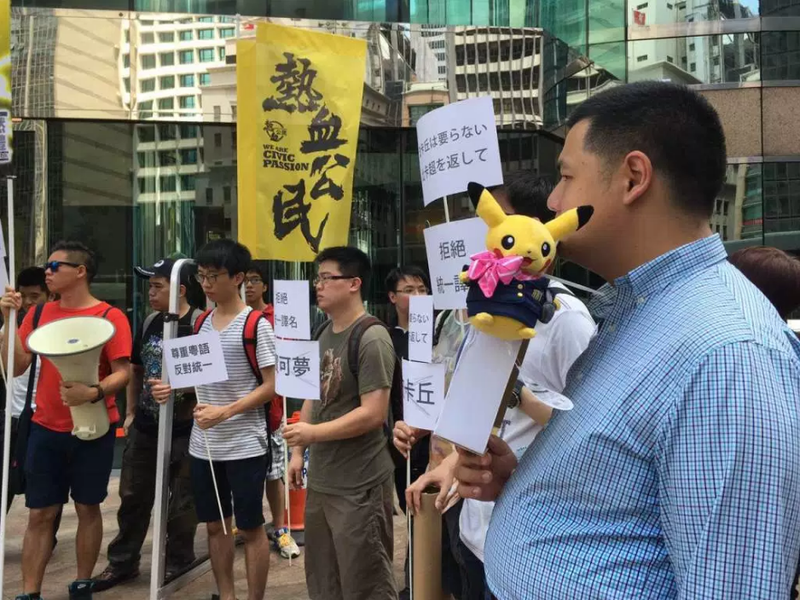 “Pikachu is 比卡超，not 皮卡丘，I hereby vow I will never buy from Nintendo again, unless you finally understand what is Cantonese and the correct Chinese usage,” writes a Facebook user. May 31 3:00am Update: Several readers point out that the banners flown at the protest are for the political group Civic Passion. Protesters also collected 6,000 signatures for a petition against the change and launched a Facebook community to express their displeasure with Nintendo’s decision. However, it seems Nintendo is keeping with the new translation.